It seems little more than a year ago Ludo finally settled down; teaming up with Jon Shook and Vinny Dotolo to open his first permanent restaurant Trois Mec. Late last year I caught wind that he would be opening up his second restaurant, Petit Trois, in the defunct Thai restaurant next door and it immediately catapulted to the top of my list. 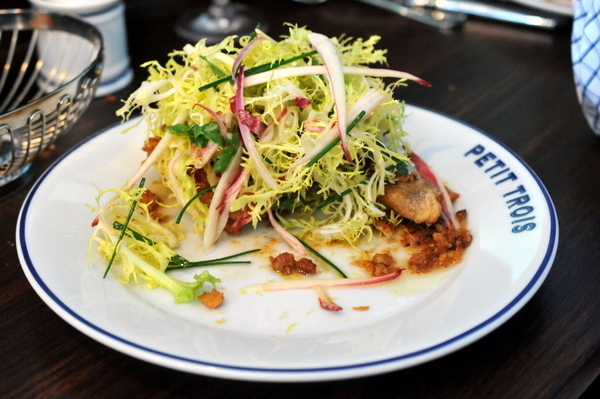 As more information became available it became clear that Petit Trois would be a completely different beast, more of a neighborhood restaurant than a fine-dining destination. Unlike its big brother, Petit Trois eschews the ticket system in fact the 21-seats are all first come first serve. 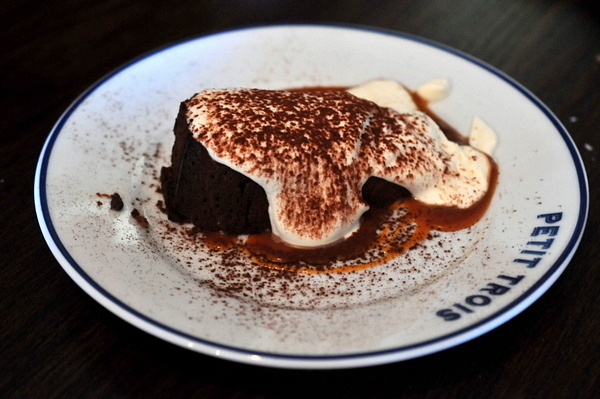 Similarly the food would be drawn from Ludo's childhood rather than the more progressive cooking at Trois Mec. On another note, at least they bothered to put up some signage this time. 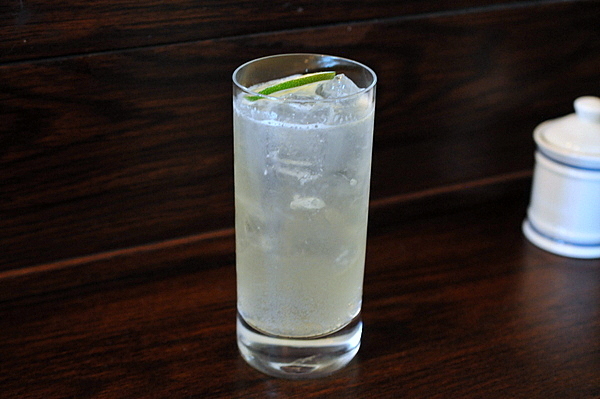 This reminded me of a drink served at The Playground in Santa Ana. 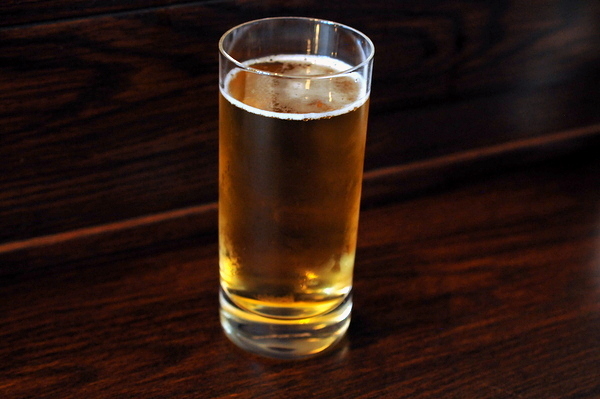 The beer and fruit temper the more extreme aspects of each other resulting in a slightly sweet easy drinking beer. I opted to start the meal with a play on the classic Gin and Tonic. The drink is light and refreshing though I would have liked a bit more bite. 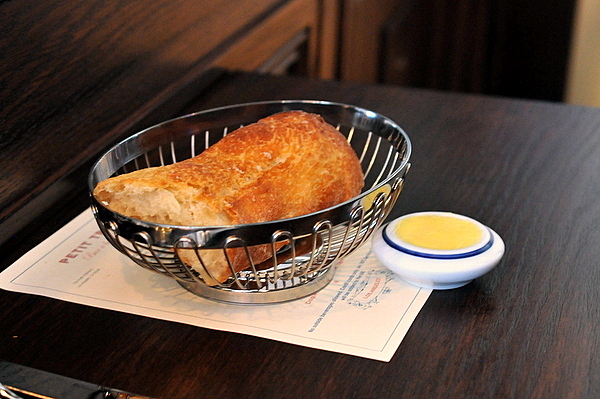 What French Bistro would be complete without fresh bread and butter. The bread comes warm with a dense crusty exterior and plenty of yeasty fragrance. The butter was even more impressive with a stunningly intense buttery flavor. 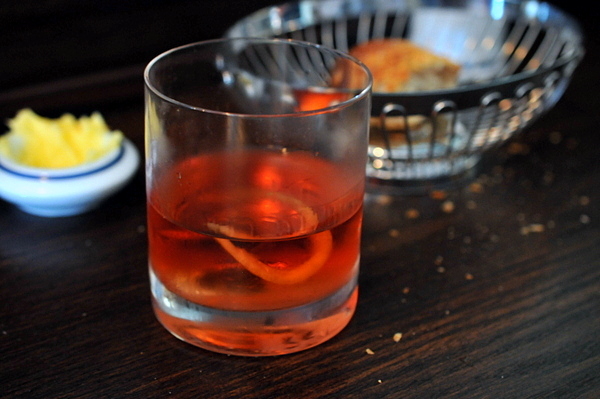 This was basically a Sazerac re-imagined with the pastis substituting for the Absinthe rinse. The flavors were familiar, but there was a bit too much emphasis on the rye. Never having been a fan of licorice I struggled to get past the Pastis. 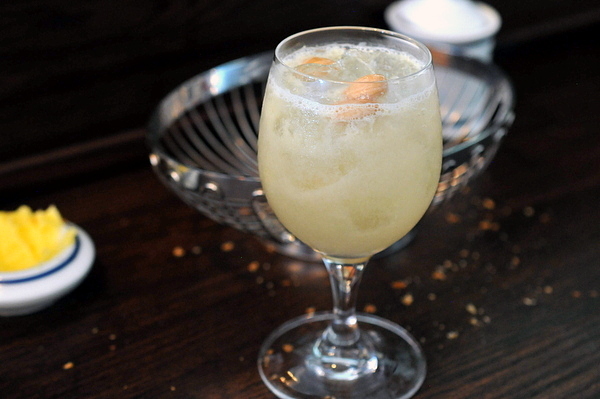 Still beyond the anise-laden attack, the drink had a ripe fruity sweetness laced with a bit of citrus. The sweet meaty tomatoes are complimented by the spicy bite of the onion and the verdant fragrance of the basil. 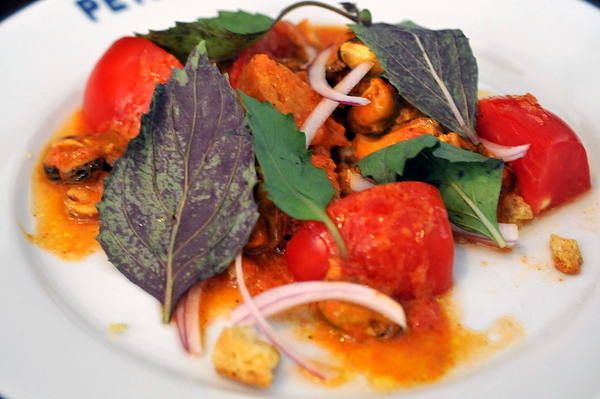 The croutons provide a toasty element as well as a stark textural contrast but it is the mussels that truly elevate this dish, bringing a unique smoky nuance to an otherwise conventional tomato salad. 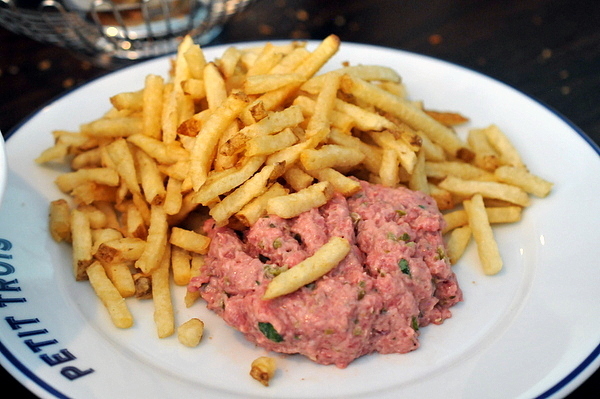 The steak tartare came to the table pre-mixed. 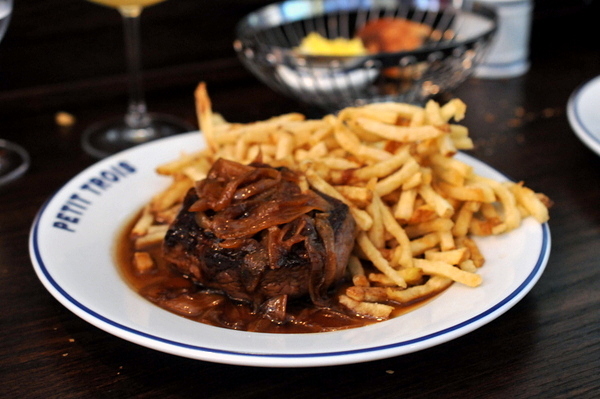 The meat had a finer texture than most with bits of either capers or cornichons mixed in giving the meat a slightly creamy mouthfeel and an inherent astringency to compliment the weightiness of the beef. 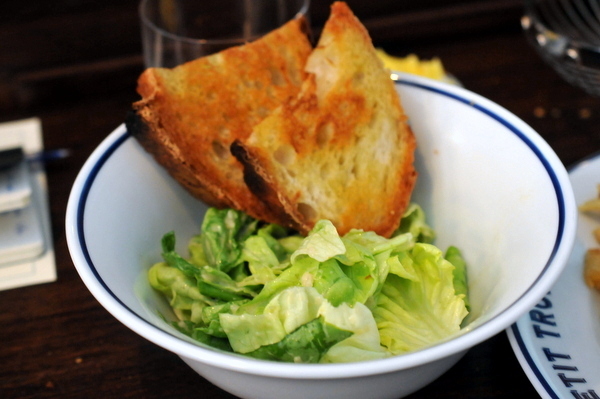 The accompanying salad had a keen acidity while the thick toast had a slightly caramelized rusticity that complimented the tartare nicely. Definitely one of the most impressive roast chicken legs that I've ever eaten. The skin is nicely crisped and topped with bits of buttery brioche crumbs that exude decadent butteriness. Personally I found the deboned thigh a touch dry, but the leg was perfectly cooked. 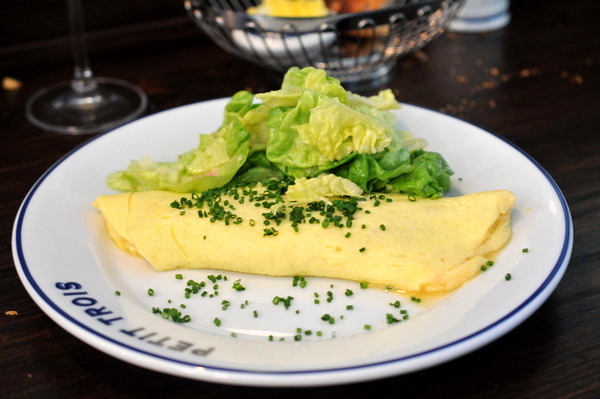 I don't think I've ever ordered an omelette outside of breakfast but the buzz surrounding this dish left me curious. Indeed, the eggs are light and fluffy and the filling of melted cheese and fresh black pepper add a surprisingly profound depth of flavor that is deftly balanced by the bright twang of the salad. This was hands down the best omelette that I've ever eaten and I can see how it has become Petit Trois' early signature dish. 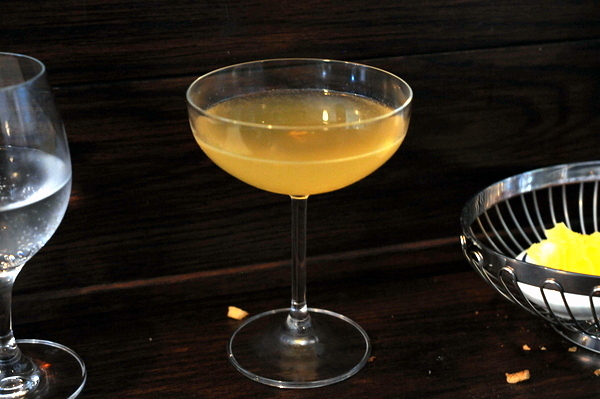 This was the most challenging cocktail for me, I've always struggled with Luxardo, the disconcerting medicinal flavor overrode all other elements of this cocktail. 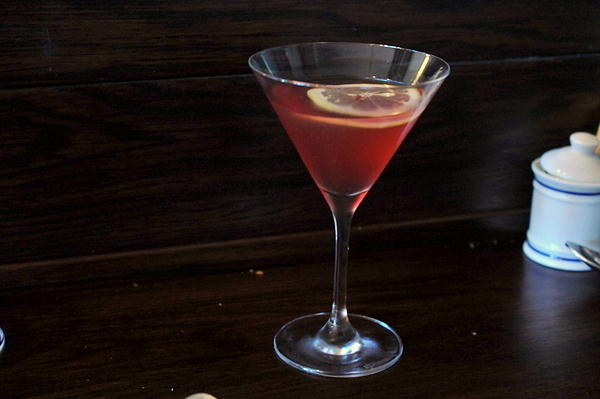 This proved to be my favorite cocktail. The aroma is reminiscent of yuzu jam but the flavor has a refreshing cucumber like bite. 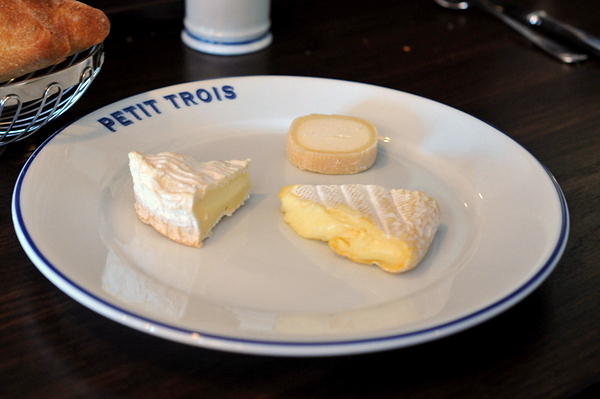 Fittingly, the cheese plate at Petit Trois is composed entirely of French cheeses. First up was Chabichou, a soft goat cheese that was definitely the leanest blending the characteristic Caprine essence coupled with a touch of astringency. The Reblochon, a cow's milk cheese from Savoy has a much sweeter fattier flavor with a touch of nutty funk. Finally the Camembert was the softest, ripest and most pungent of the three cheeses. Despite having finished our meal we ordered the final cocktail for completeness sake. 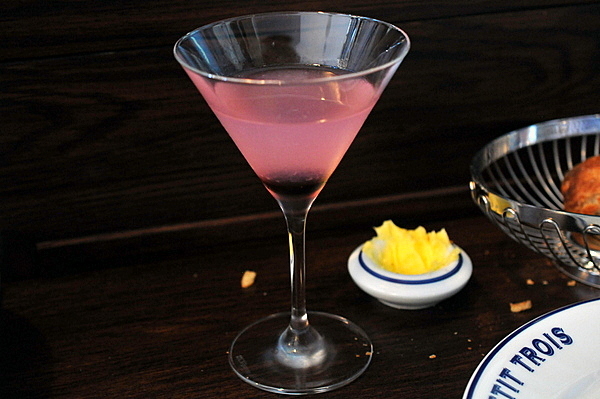 The reduced wine and gin temper each other leaving a muted herbal sweetness. The champagne isn't immediately noticeable except for the hint of effervescence. I thought this dessert succinctly captured Petit Trois charm. 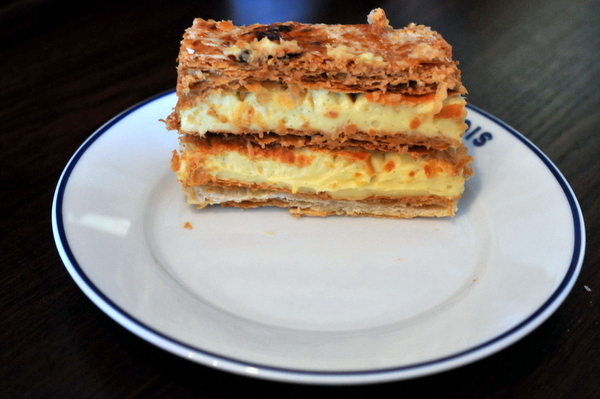 The flavor profile couldn't be simpler; a combination of buttery puff pastry with soft vivid vanilla, but the execution from the perfect harmony of flavor to the lovely textural contrast between the cream and pastry exemplifies the bistro philosophy of high-quality yet modest cooking. The final dessert was a straightforward chocolate cake. The decadent purity of the chocolate contrasted beautifully with the whipped airy levity of the cream though I found the cake just the slightest bit too dry for my tastes. Petit Trois serves inventive, impeccably-executed hearty bistro fare; don't expect to find pear kimchi chutney or black olive molé. The food is a departure from Ludo's traditional globe-spanning cuisine, but for someone who has made a career defying convention, Petit Trois was a refreshing look at the classic French cuisine of his formative years. Nice!!! I missed their opening by a month but oh well. 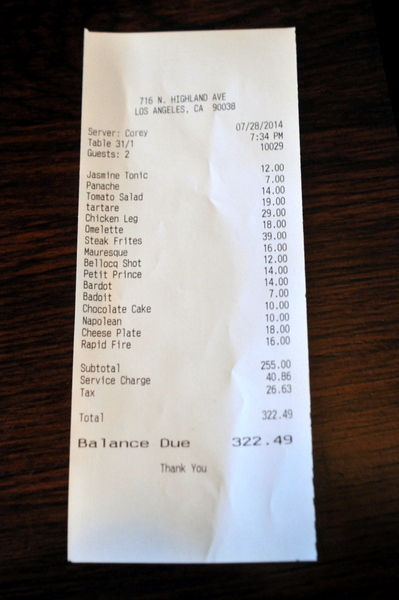 Seems like it's a must hit spot when I'm in LA. Thanks for the post!